What if pets had the power to save the day for humans in distress? 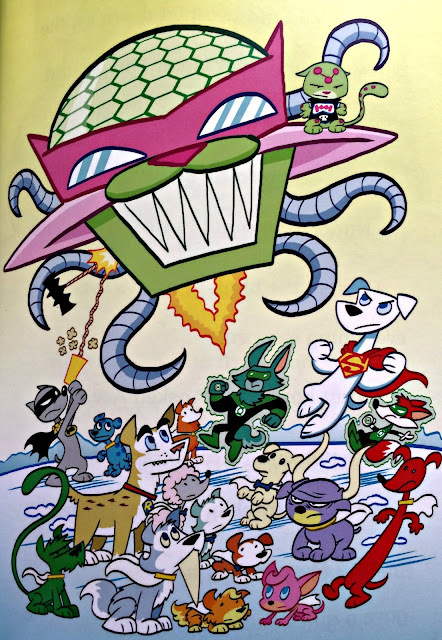 That is the theme for a line of books by Capstone Publishing called the DC Super-Pets. In these stories the pets of the heroes and villains from the DC comic book universe have their own super powers which are demonstrated through their embarking on various adventures and challenges. My seven year old twins really enjoy the DC Super-Pets books and are just the right age for this series which is written for children six to nine years old who are in first through third grade; though I have to admit this 40 year old dad enjoys reading these stories just as much as his kids do. 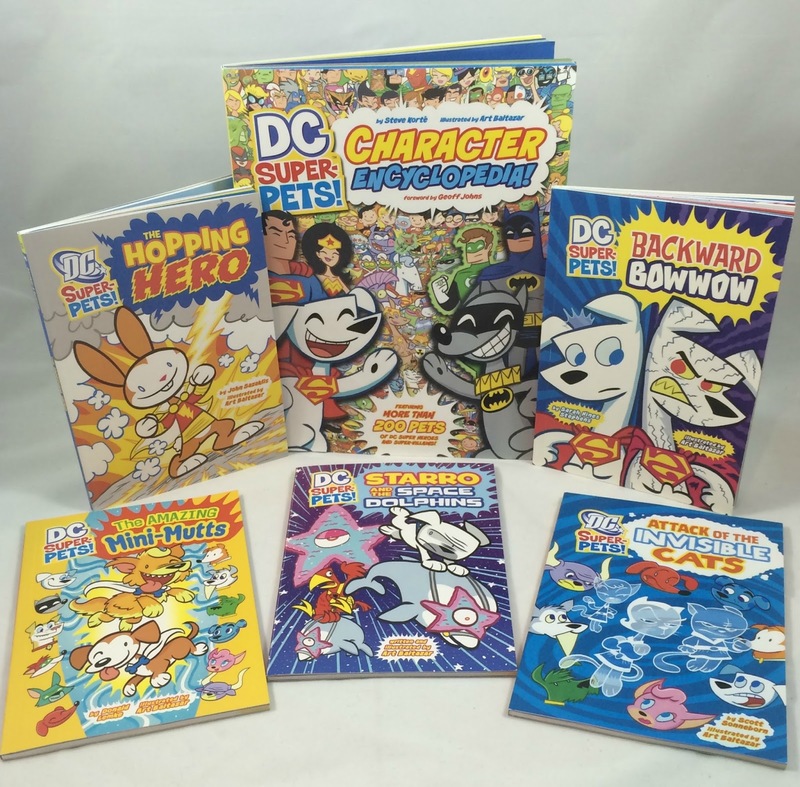 DC Super-Pets stories are designed to help early readers transition to chapter books. Each book is normally three chapters long and filled with large-sized text and colorful illustrations so they aren't overwhelming for young readers. 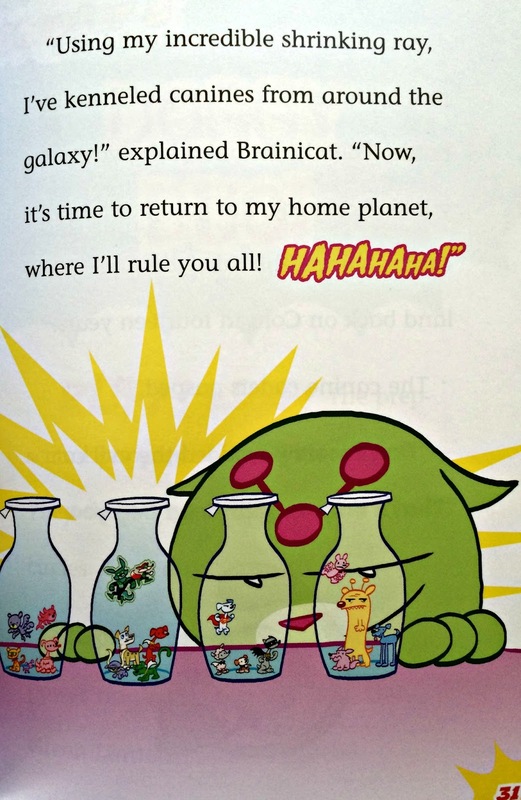 In fact the fun illustrations of the Super-Pets combined with goofy scenarios attract children towards wanting to read these books. While DC Super-Pets are of course fictional creations there are animals in the real world that help make a positive difference in people's lives. For example K-9 dogs are trained to help police search for illegal drugs or explosives and service dogs can provide assistance to people with disabilities. Therapy dogs can also play an important role in helping improve lives by providing affection and comfort to people in hospitals, retirement homes, schools, and disaster areas and to those with Alzheimer's Disease or Autism. For example, therapy dogs were brought in to help the survivors of the tragic Sandy Hook Elementary School shooting in Newton, Connecticut cope with the incident and are credited with providing peace of mind to the shocked and devastated children and adults these real life super pets interacted with. Our local public library incorporates assisting with the training of a therapy dog into its children's summer reading program. Reading to therapy dogs helps kids practice their literary skills over the summer while helping train the animals to be comfortable interacting with people. 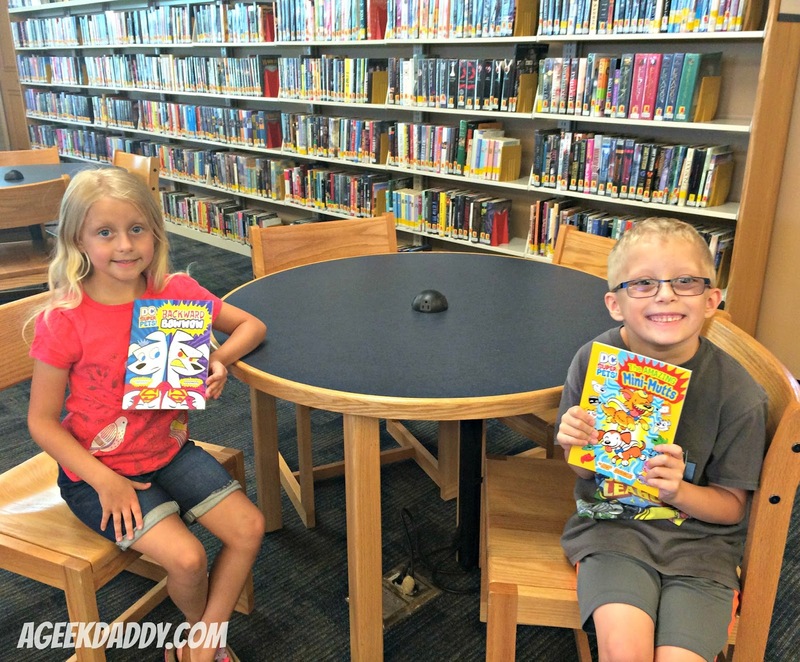 It also gets children excited about reading over the summer which is a time when unfortunately books are often tossed aside for other activities. My kids really look forward to these reading sessions and take a lot of pride in they are helping a dog so that it can help others. They've been really excited to share their DC Super-Pets stories with a real life super pet who will one day be helping people in distress when reading during the therapy dog training at the public library. 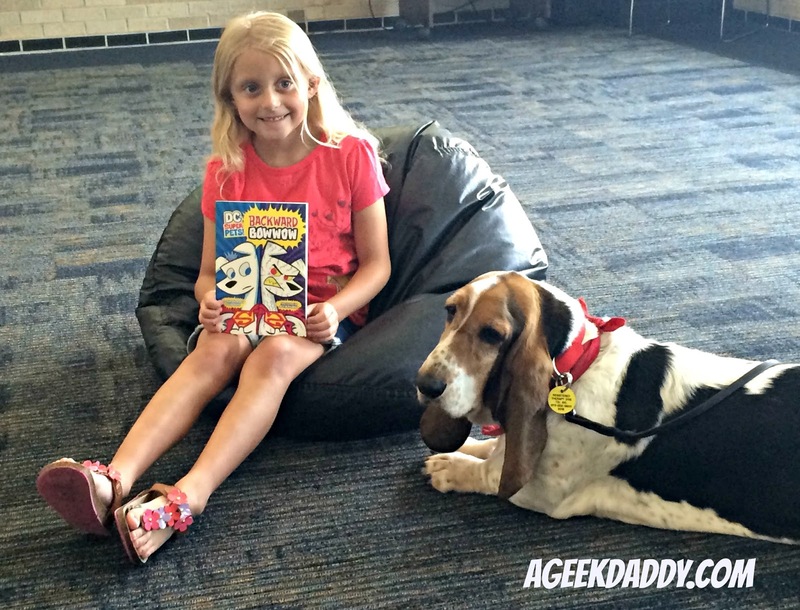 My daughter has been reading DC Super-Pets BACKWARD BOWWOW during her therapy dog training sessions. In this story, when Bizarro Krypto crash lands on Earth, he can't believe his eyes. Humans own dogs as pets! On his Bizarro planet, everything is the exact opposite -- canines rule the world! Before returning home, he promises to make things right ... or maybe wrong. Can Krypto the Super-Dog intervene and prevent Bizarro Krypto from making a huge mess? 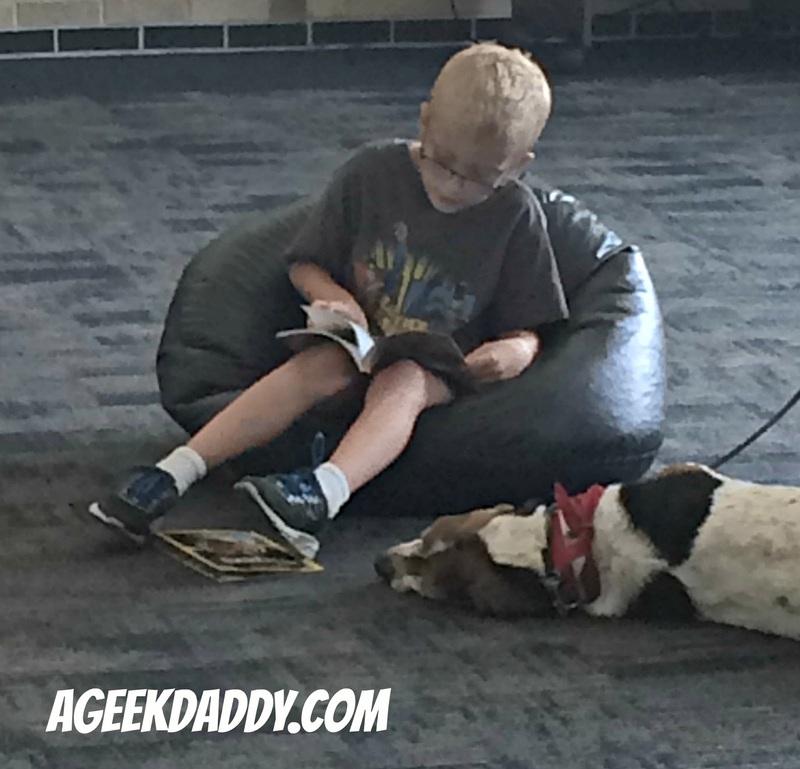 My son has been reading DC Super-Pets THE AMAZING MINI-MUTTS as he helps train the therapy dog. In this book, Krypto, Ace, and other Super-Pet pooches visit the Bowwow Boot Camp to show a new breed of heroes a few tricks. But the evil Brainicat wants to teach the canine cadets a lesson as well. When he shrinks them all to microscopic size, the prep-school puppies must quickly learn to step up! If you'd like to know more on how you can contribute to training therapy dogs or for a referral to obtain the services of one, please visit the Therapy Dog International website at tdi-dog.org.